Been checking back on the awesome progress The Jazz Room crew has made since I shot some pics of their new stage being built earlier this month. 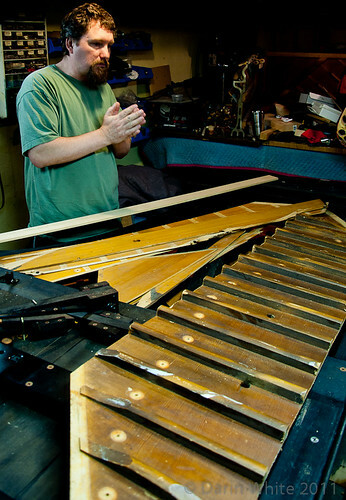 It was my makerly privilege to get a peek at the in-progress rebuild of a 7-foot grand piano that The Grand River Jazz Society is hoping to acquire through grants and donations. 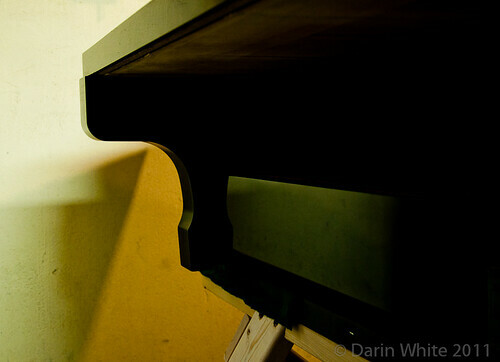 This piano would serve as the centrepiece of this dynamite venue we’re all eagerly anticipating. 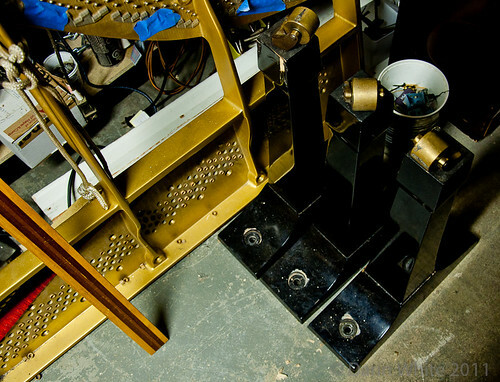 William Horne, master rebuilder of pianos, generously opened his Waterloo workshop on Tuesday so I could shoot some photos to capture a piece of this transformation. to restore. 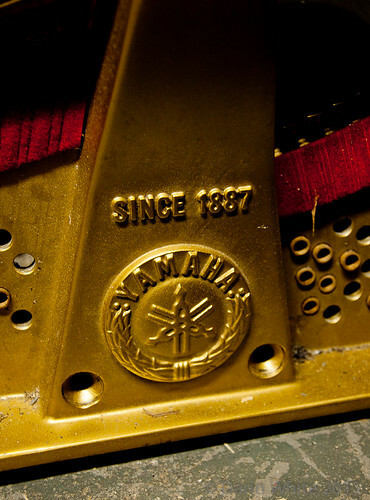 This piano spent a number of years on-stage at the Waterloo Stage Theatre. The fold down pedals seem out of place on the topside. 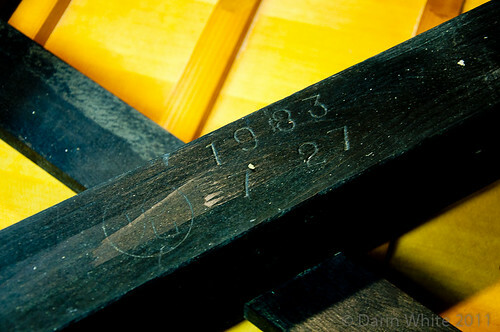 Birth certificate, making this piano 28 years old. 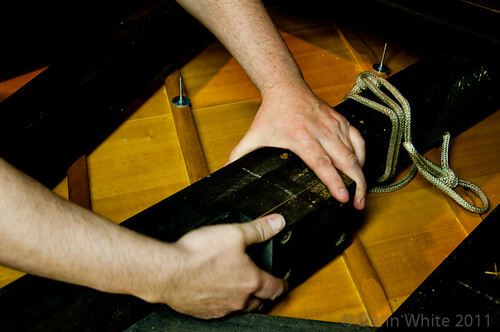 Changing levels of humidity where pianos live can wreak havoc with the soundboard causing it to crack. Here we see a crack mid-fix. 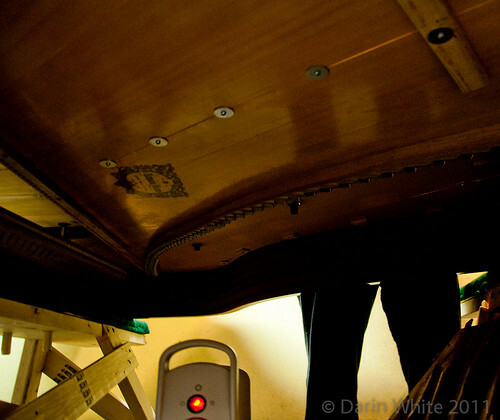 When the soundboard cracks, the lovely resonant sound of the piano strings vibrating degrades into a rough buzzing. 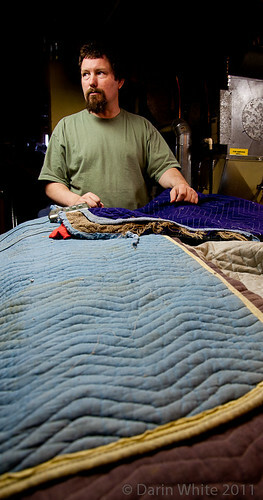 William has been doing the painstaking work of piano restoration for more than 20 years. He’s also a musician, and, I would suggest, a meta-musician: (re)making the thing that makes the music. 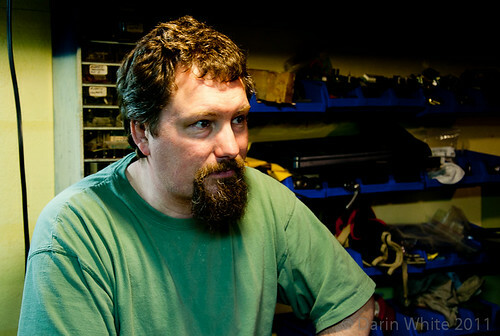 A maker’s maker. 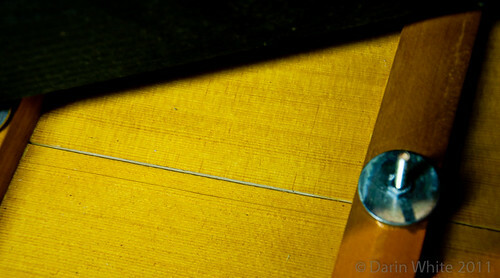 has a beautiful shape and is where the strings are eventually strung. Once strung, the strings together will pull with about 20,000 pounds of force, hence the the massively heavy metal (ahem) construction of the plate. 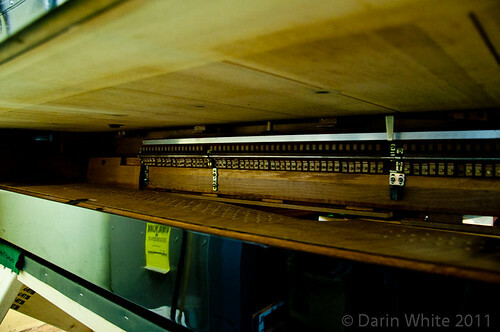 Peering into the guts where the strings, keys, hammers, and action (more lingo) has been removed and which is being rebuilt by local piano technician and tuner, Paul Wall in his shop. As I said: upside-down. On some pretty substantial sawhorses. It takes a chain fall to shift this massive instrument, hence the rope sling in the next pic. bring it back to life. Fantastic timber bones inside and wooden parts made to tolerances of thousandths of an inch. 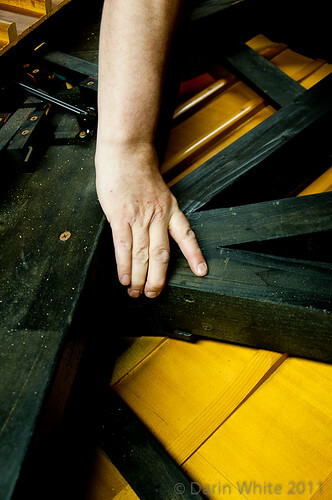 Piano restoration is a labour of love. Nobody gets into this business to get rich. 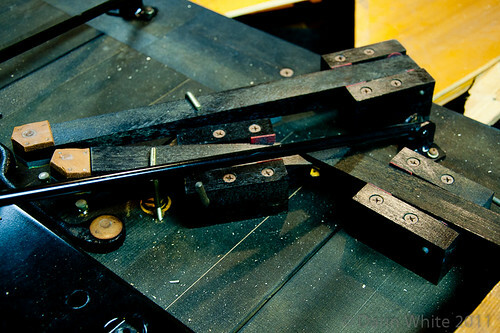 William described the kick in this work as being the great feeling when the instrument comes alive again with great sound. 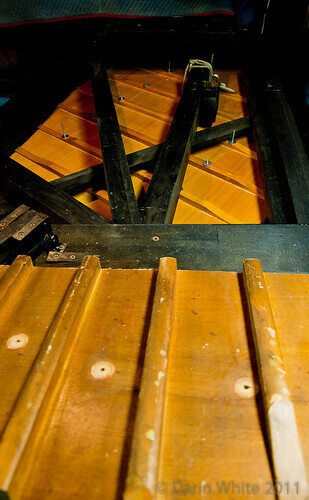 the moisture content of the wood is leveled out and the soundboard cracks can be repaired. Here we see bolts with big fender washers holding the repaired joint together. The bolts will later be removed and replaced with wooden dowel. 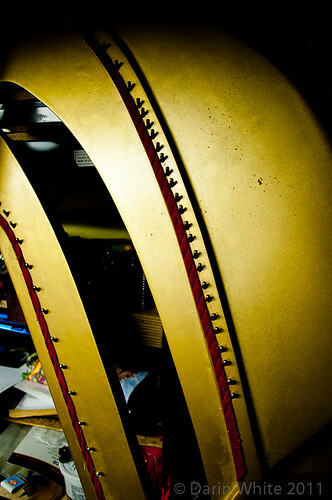 The soundboard repair is primarily done with yellow wood glue. Around the edge, where the soundboard fastens to the frame, cyanoacrylate (aka crazy glue) is used because it wicks into the joint better. And that’s just one phase of the restoration! 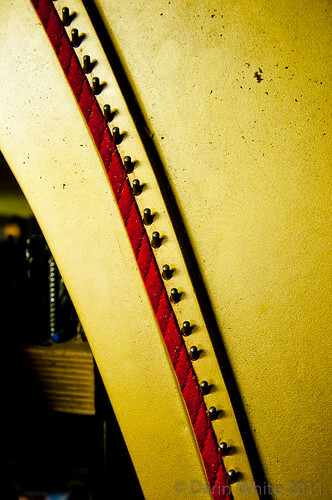 The “plate” with the strings will eventually be reinstalled on this side of the soundboard once the piano is flipped back over. Stephen Preece, Executive Director of The Grand River Jazz Society (which is the driving force behind The Jazz Room), connected me with this great opportunity. Thanks Stephen! There’s an amazing aesthetic to these parts. Now just imagine the beautiful music that will one day soon come from them again. 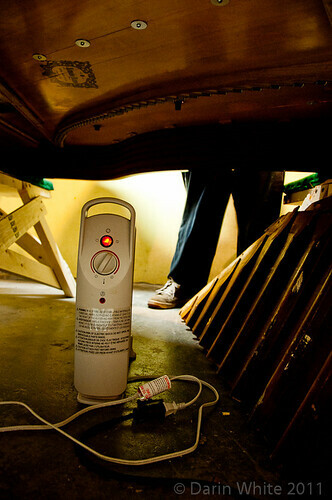 This entry was posted in fieldtrip, music and tagged maker's maker, piano, The Jazz Room. Bookmark the permalink. Thanks for writing about this, Darin…as a board member of GRJS, it’s great to see the word getting out, and great to see it actually happening. 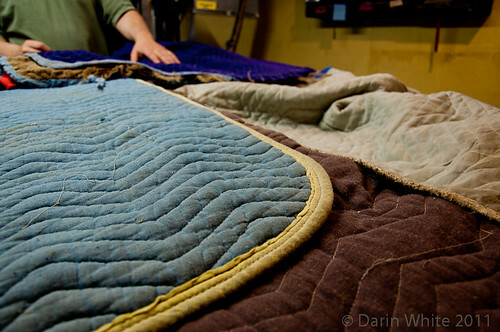 Awesome pics and article Darin! 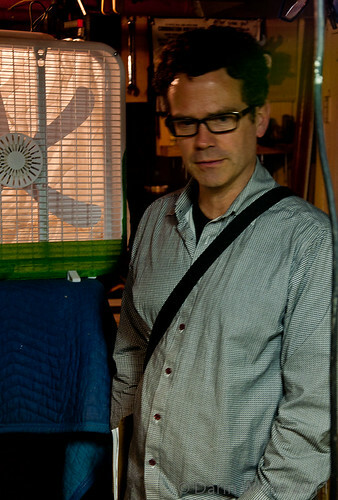 William is creating magic — thank you for profiling the fantastic work he so lovingly partakes in. Thanks so much for sharing this wonderful story, DW! As a future guest artist in The Jazz Room, I can’t wait to hear the results of this amazing transformation. It will happen! Oh, yes – it will happen! The community response to The Jazz Room initiative is massively positive. I know this will be a huge success. keep me posted concerning the piano. would be grateful to receive performance dates at the new venue (when appropriate), appearing musicians & any other worthwhile information. You should probably connect with The Jazz Room folks at KWJazzRoom@yahoo.ca for updates on schedules and shows.